Every once and a while I get an email from someone that reminds me that the human race and even animails are "hard wired" for art. Neanderthals made jewelry, art objects that along with flowers were found in graves of family members. I was sent this email a couple of times. You may have seen these pictures; but, I couldn't resist passing it along. Wish I could properly credit the original author and photographer for these pictures. No credits accompanied the email. 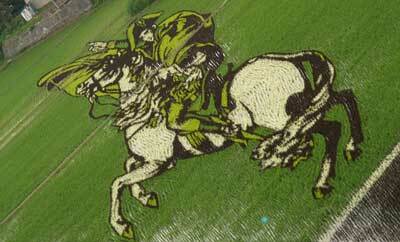 I'll bet rice field art generates a lot art tourism! "This is absolutely amazing and so beautiful ? we need to look at things like this some to keep us sane ? There is good talent in the world! RICE FIELDS OF JAPAN ? Astounding. Farmers creating the huge displays use no ink or dye. Instead, different color rice plants have been precisely and strategically arranged and grown in the paddy fields. As summer progresses and the plants shoot up, the detailed artwork begins to emerge. The colors are created by using different varieties. This photo was taken in Inakadate, Japan. Napoleon on horseback can be seen from the skies. This was created by precision planting and months of planning by villagers and farmers located inInakadate. 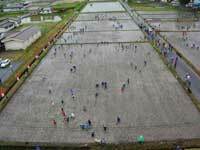 Farmers create the murals by planting little purple and yellow-leafed Kodaimai rice along with their local green-leafed Tsugaru, a Roman variety, to create the colored patterns. This is done between planting and harvesting in September. From ground level the designs are invisible, and viewers have to climb the mock castle tower of the village office to get a glimpse of the work. 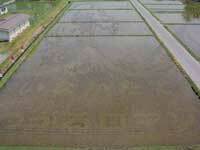 Closer to the image, the careful placement of thousands of rice plants in the paddy fields can be seen. Rice-paddy art was started there in 1993 as a local revitalization project, an idea that grew from meetings of village committees. The different varieties of rice plants grow alongside each other to create the masterpieces. In the first nine years, the village office workers and local farmers grew a simple design of Mount Iwaki every year. But their ideas grew more complicated and attracted more attention. 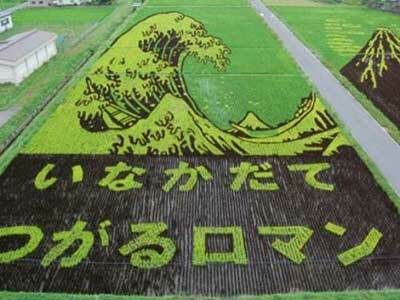 In 2005 agreements between landowners allowed the creation of enormous rice paddy art plantings.